Does anyone else love lists as much as I do? If you enjoy ‘My Current Favorite Things’ posts, I have a treat for you. This new installment of lists is my top ten favorite bloggers and sites! This week is all about yummy fandom recipes and the wonderful, talented bloggers who bring those recipes to us! Meet Sarah and Matthew, the geniuses behind Geeks Who Eat. You can find everything from Disney to video game inspired recipes on their blog. They even have party guides! Throwing at 80’s party? How about a horror movie party? From entertainment to recipes to decor, Geeks Who Eat have complete party guides for you. From books to film to TV (and even anime), Sharon at ReadWatchEat shares unique recipes with rundowns of why she made this recipe. One of my favorite things about ReadWatchEat is how simple the recipes are. Y’all know I love to cook but I am a lazy cook. Sharon takes care of me with her simplicity and short grocery lists. Monica over at Popcorner Reviews not only posts about geek fashion and DIY’s, but she also posts geeky recipes! From Marvel to Star Wars, there’s something there for everyone. Monica even has beautifully staged finish recipes for you to drool over. In Literature has been mentioned before on my blog, especially for Month of Magic. Not only do I adore the aesthetic that is In Literature, but I love the recipes and the thought put behind each one. They are literally works of art. In Literature also has wonderful themed parties like Hogwarts and Fantastic Beasts. Witchy Kitchen isn’t just for Halloween. I actually stumbled across Witchy Kitchen on Instagram first and was drawn in by the amazing food flat lays! From Pokemon to Stranger Things, dig into the dark aesthetic of Witchy Kitchen’s site to find your new favorite fandom recipes! Video games and food you say? Victoria at Pixelated Provisions puts my two favorite things together on her blog. From Overwatch to Fallout, you can find so many video game inspired recipes. These would be amazing for a video game themed party! If you can’t tell from the name, let me introduce to you the master tumblr of Pokemon inspired recipes: The Cupcakedex! Whether you want to just browse amazing pictures of Pokemon food or actually want to try the recipes yourself, this site is amazing. The Gluttonous Geek‘s blog is packed with pop culture food and recipes. Browse the site by fandom or check out the reviews on other fandom cook books and more! From comics to tabletop games, there’s plenty of recipes to check out. Baking Mischief has a cool Tumblr dedicated to the fandom recipes they make called Baking Mischief Managed. Super cool name for those who get the HP reference. Not only on these recipes creative, but lots of them are easy to make for those lazy cooks out there (me). Check out this huge master post for nerdy recipes! I stumbled across Geeky Hostess while looking up the game Deer Lord. She had an amazing party for the game and I ended up digging around on the site for more ideas! she’s got plenty of cool party ideas to go along with her rad recipes. I mean just look at this Cuphead inspired cake! Don’t forget to take a look at the shop while you’re there. What are your favorite geeky food blogs? List them in the comments for everyone to check out! And now I’m ridiculously hungry. Though, in fairness, I am often that way. I posted this at lunchtime for that very reason. I do have to say though that my packed lunch didn’t come close to these delicious recipes. Nor did my Granny Smith apple, crackers, and peanuts. Sweet! 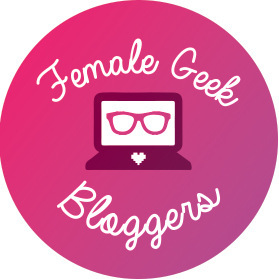 Thanks for shout out, fellow sister in geekdom! ooooh this reminds me – have you watched Binging with Babish on youtube? I haven’t but I will definitely give it a try!